After a lot of brouhaha about the Apple iWatch, Apple has finally announced its smartwatch along with iPhone 6 and iPhone 6 Plus. The smartwatch which has been popularly called iWatch will not inherit the rumored name. It will be simply known as the Apple Watch. Just like every other products Apple unfolded some new surprises with its wearable device from Cupertini. Tim Cook has made several statements one of which is that the Apple watch should not be confused to be a miniature version of iPhone. Rather Apple has thought much ahead of time and has designed several revamps in the hardware and UI like buttons to zoom the screen in and out. Besides, Cook also stated that the Apple Watch will strongly promote health and Fitness since it’s Cook’s topmost priority and he wants this to be important to everyone’s lives. So it’s for sure that the watch will have plenty of fitness trackers and sensors incorporated in it. An interesting facility that has been added with Apple Watch is that whenever you move your hand in front of your eyes, like the way we do while checking time in our watch, the device will automatically enable its touchscreen and the app dots will appear on the screen. Other than this there will be a bar of widgets that pops up when the user slide in a bottom to top direction on the screen. The most prominent apps for Health are Fitness and Workout. You can check notifications, dictate message with the help of taptic engine and so on. 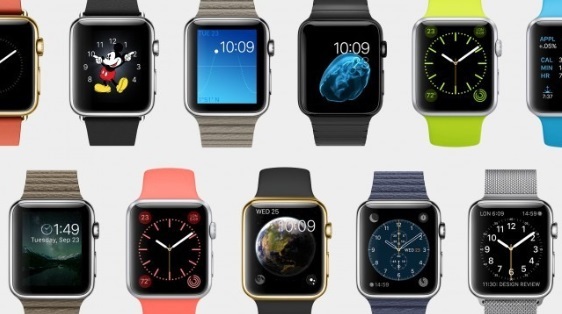 We have given a brief outline of the glut of features Apple is bringing with Apple Watch. Apple has consented selectively some exceptional popular app devs and one of them is Facebook. Other devs being selected for Apple watch are American Airlines, City Mapper and Apple. Apple smartwatch will be available in several variants, based on size and the body. The body comes in three different splendid options like aluminum, stainless steel and 18-carat gold. But one mandatory requirement for this amazing device is definitely an iPhone. So it doesn’t matter how much you are getting allured with the wearable you must own an iPhone first. Now the most important aspects- the price and date of release. Well, date of release is estimated to be early 2015 but no official date has been mentioned. About price, Apple Watch will start from $349.